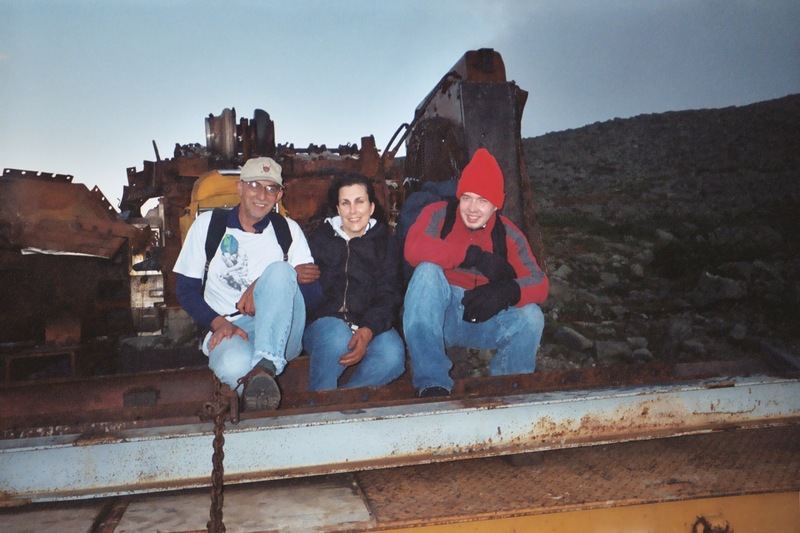 Bill, myself, and Matt catching a ride on the back of a flatbed after hiking to Mt. Washington’s summit. Several years ago (my then future husband) Bill invited me to join him and three of his children on a hiking trip. I had no experience with hiking and had only a vague notion of the physical expectations, but with my sweetheart’s encouragement and, after some internet research, I accepted (cautiously) to join him to climb Mount Washington, New Hampshire. Next, I am not exaggerating when I say the terrain is rocky. We took the Tuckerman’s Ravine Trail and I was blown away by how much rock we walked on. The trail was paved with rock. My feet have not forgotten! And it doesn’t get any better as you climb. There are areas with less rock and beautiful mountain streams and scenic vistas, but as you reach higher elevations the rocks just get BIGGER. I wish I had been in better physical condition for this hike because the rocks and the climbing were very hard on my knees. We took some little rests along the way, but it never got any easier. I’ll spare you all the details (hours worth) and share with you that the saving grace in all this was my sweetheart. He listened to my complaints, carried my backpack, and steadily encouraged me each step of the way. He especially supported me as we entered the last stretch of our hike. Each time we looked up, we thought we would see the final ridge, only to realize that there was yet another ridge above that one. As it got later in the day and the air became colder, we were eager to reach the summit and conclude our hike. And of course, it was difficult to say when that would be. When we heard the whistle of the final cog rail train sound, we knew that we would not be going down the mountain that way. That was a very anxious moment! But my sweetheart urged me and his son, Matt on and we made it to the summit. What a fantastic feeling to make it to the top; to know that we conquered (what was for me) a difficult path and that we did it together! Since that time I have thought about the ways that my husband and I have supported and encouraged each other in our marriage, taking turns carrying the weight when the other was struggling. That’s what makes the journey worthwhile, knowing that we can enjoy it and experience it together. I think of that trip as an adventure! We came out as survivors! I left out a lot of details, but there were quite a few challenging moments. Poor Theo with her SEVERE case of pink eye! And trying to return home through NYC during the major blackout – go figure? We had a lot of humorous moments, too. Like Matt packing a hoagie in his oversized backpack. I had no idea that he had purchased the sandwich until we were maybe halfway up Mt. Washington and he pulls it out. Your dad and I are eating energy bars and he’s got this hoagie…survival food! I learned a lot about each of you, your dad, and myself on that trip. When I look back, I can understand everyone better and laugh at everything more. I came away from the experience knowing that I can always put my trust in my husband (your dad) and that I am part of a strong and resilient family. We may be quirky, but we’re resilient!